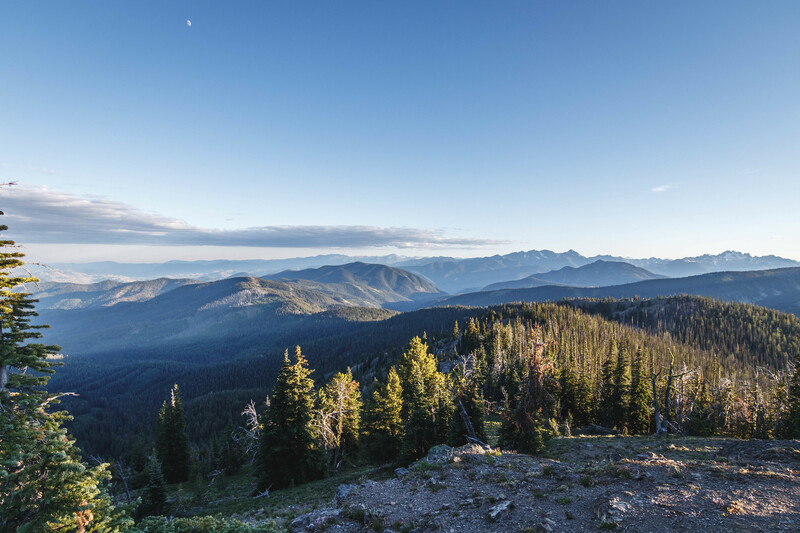 For Sunrise Peak in the Lake Chelan-Sawtooth Wilderness, check out this post. 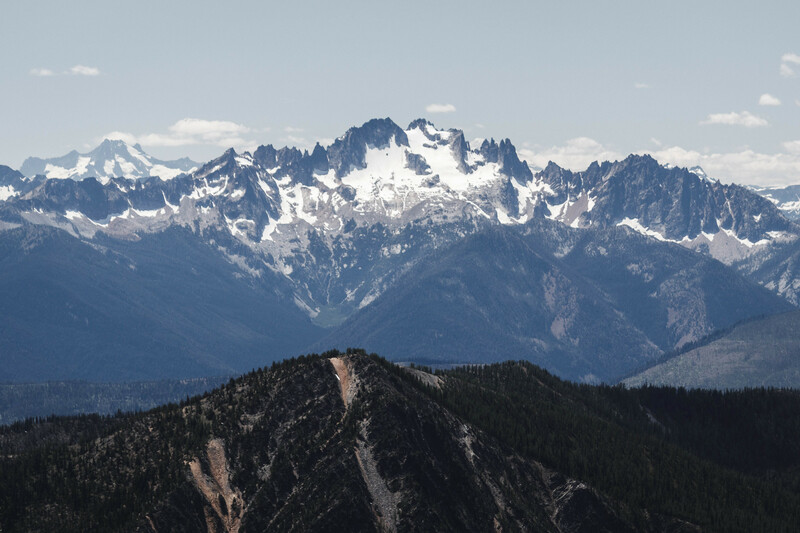 For Sherman Peak in the Mount Baker Wilderness, check out this post. 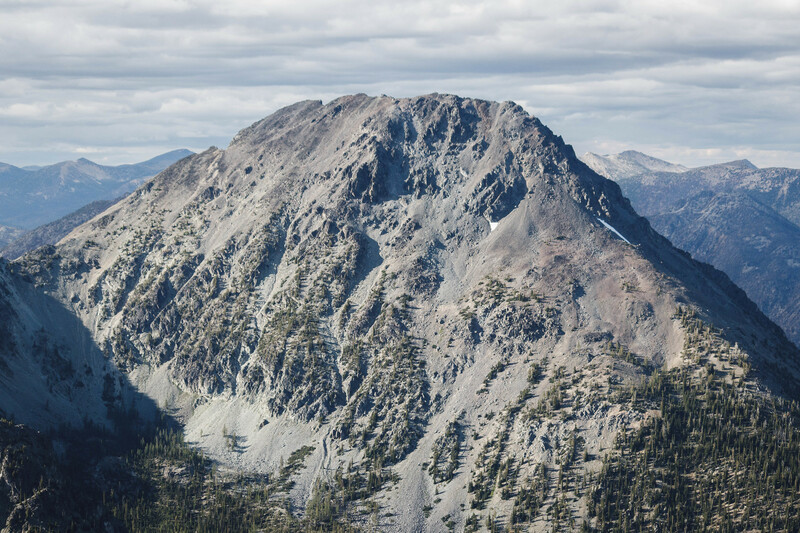 Original plan was to spend the night on Sunrise Peak and climb Sherman Peak the next day. But hot weather and the unlikelihood of finding a water source on the ridge had me rethink our plan. In the end I decided that we’d be better off getting both peaks in one long day than trying to keep ourselves entertained in hot weather the rest of day one. Conditions on Road 52 hadn’t changed much since our visit over Memorial Day weekend. Road was still good past Road 500 junction where we had turned onto previously. Road 300 turned out to be in much better shape than anticipated, with new gravel added to level out washed out sections. Other than moving a few big rocks, no issues in getting through the entire road in a low-clearance vehicle. We received a warm welcome from some curious roaming cattle before the empty parking area. Trail looked well-kept despite being remote, a nice one-mile hike to the inconspicuous trail junction at 5,000′, which we accidentally overshot by quarter of a mile before realizing we had gone too far. 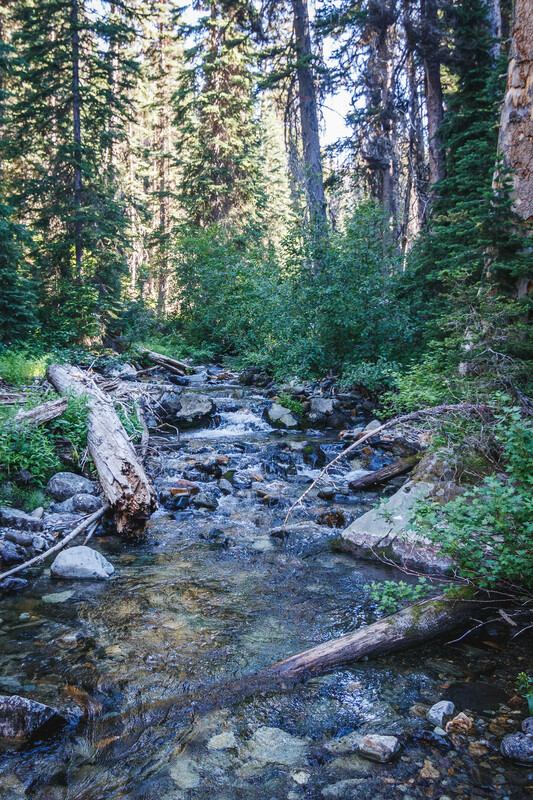 We backtracked and found the old trail leading down to the shallow Goat Creek, and crossed without issues. On the other side the trail immediately picked up elevation along steep hills and worked its way into Panther Creek Basin. Trail stayed east of the creek and it became increasingly faint higher up in the basin. 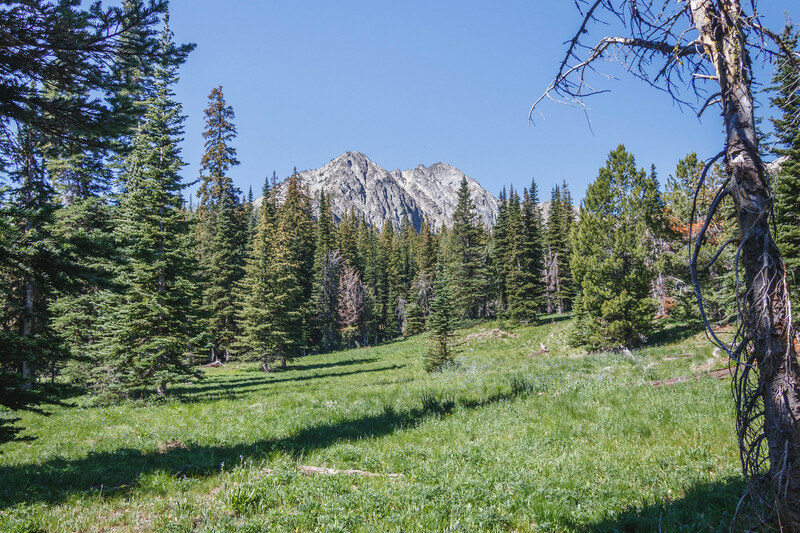 We managed to stay on track by following cut trees until we reached the open meadow at 6,400′ where Bullhorn Peak first came into view. Scrambling toward head of the basin, we attained Sunrise Peak south-east ridge saddle at 7,400′, west of Point 7392. There we got our first look at both destinations as well as The Craggies. Heading west on the rocky ridge crest while gaining a few hundred feet of elevation, we attained Sunrise Peak south ridge at 7,760′. Immense views behind us to the south as we traversed north on the gentle ridge crest onto the broad summit. McLeod Mountain’s north face looked daunting compared with its gentle south ridge. Northern aspect of Silver Star Mountain with Silver Moon and Vasiliki Ridge on either side was my favorite view of all. The 80-degree weather felt significantly cooler thanks in part to summit breeze. Pup and I stayed for an hour before making our way down into Goat Creek Basin toward Sherman Peak. 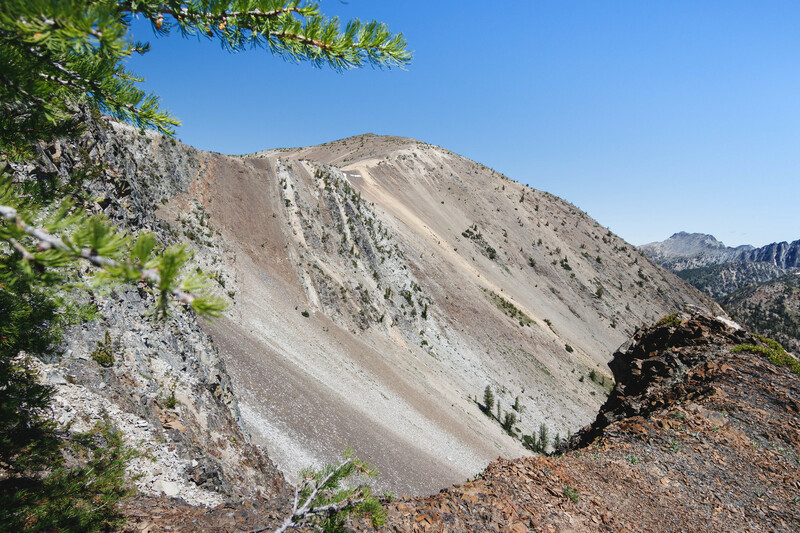 Maintaining an average elevation of 6,200′ on the mostly open terrain, we moved through several ravines in the forest before arriving at Sherman Peak south-west ridge. Travelling east on west ridge, we entered the northeast-trending scree gully at 7,000′. With open views behind us, we moved through steeper section of the gully from 7,200′ to 7,400′ on a dirt path before arriving below a slab wall. An exposed ramp in the slabs allowed us to exit the gully and get onto gentle terrain from 7,400′ onward. We enjoyed a leisure walk through heather and minor taluses for the next 800′ to the top. Another fine vantage point with awesome views up and down the Isabella Ridge. After soaking in the views, pup and I started making our way down Isabella Ridge through a couple of high points to Sweetgrass Ridge. The area had undergone wildfires and it took some time to get through all the down trees. On the 5,800′ saddle south of Sweetgrass Ridge high point, we turned right (west) and followed the drainage 1,200′ down and came out onto Road 300 where we started the trip.